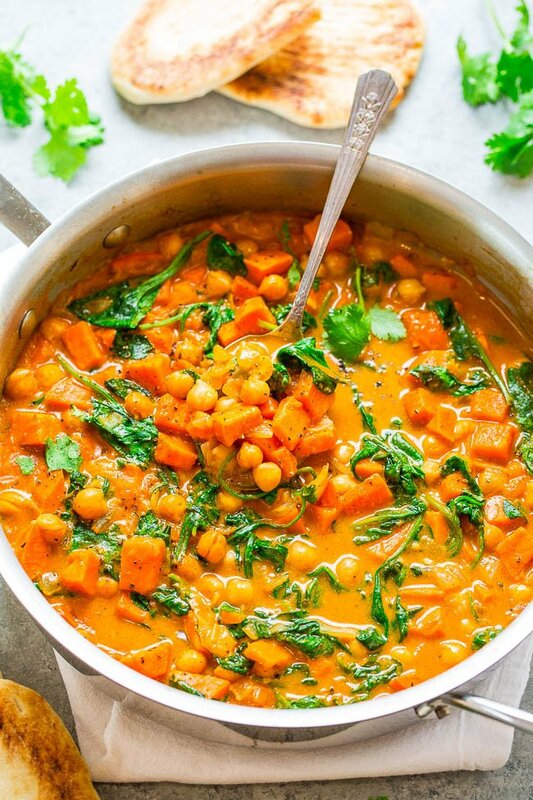 Sweet Potato and Chickpea Coconut Curry – An EASY one-skillet curry that’s ready in 30 minutes and is layered with so many fabulous flavors!! HEALTHY comfort food that tastes AMAZING!! 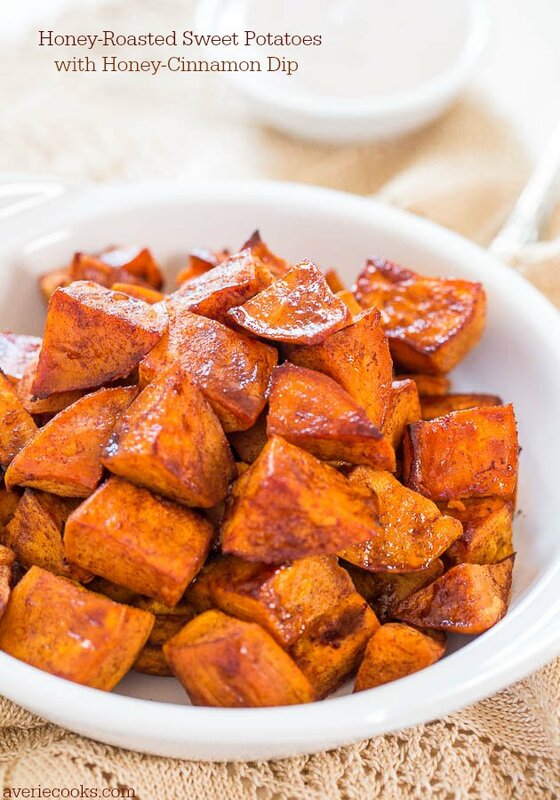 Sweet potatoes are something I crave especially when the weather cools off and this recipe is a new favorite way to enjoy them. I could eat this every day and be a very happy camper. It’s an easy curry that’s healthy, made in one skillet, ready in 30 minutes, hearty, comforting, and naturally vegan and gluten-free. If you’re trying to make more meatless meals, this is a winner. You’ll never miss the meat because between the sweet potatoes, chickpeas, and spinach there’s a lot of great textures going on to keep you full and satisfied. And holy moly, let’s talk about the flavor explosion going on. Onions are sautéed in coconut oil with garlic, ginger, and coriander before adding Thai red curry paste, coconut milk, lime juice, soy sauce, and finishing the dish with spinach and cilantro. The ingredients create layers of unami goodness. 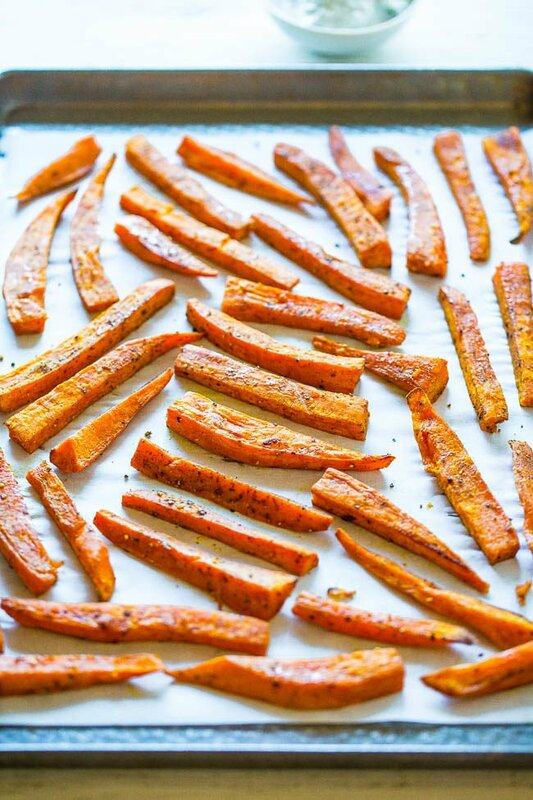 Savory, with a touch of acid from the lime juice, and natural sweetness from the sweet potatoes and sweet Vidalia onions. I used Thai red curry paste because I think it adds a richer and smoother flavor profile than curry powder (Indian) does, but if all you have is curry powder, go for it knowing that the flavor of Thai vs. Indian curry products is vastly different and your dish won’t taste like mine. As with all curry pastes and powders, they vary in intensity and everyone’s preferences for spice and heat vary, so adjust to taste. I used 2 rounded tablespoons and I wouldn’t call it spicy but there’s robust flavor. My 10-year-old said she gives it a 4 on a 1-10 scale of spiciness. We like spicy food though. 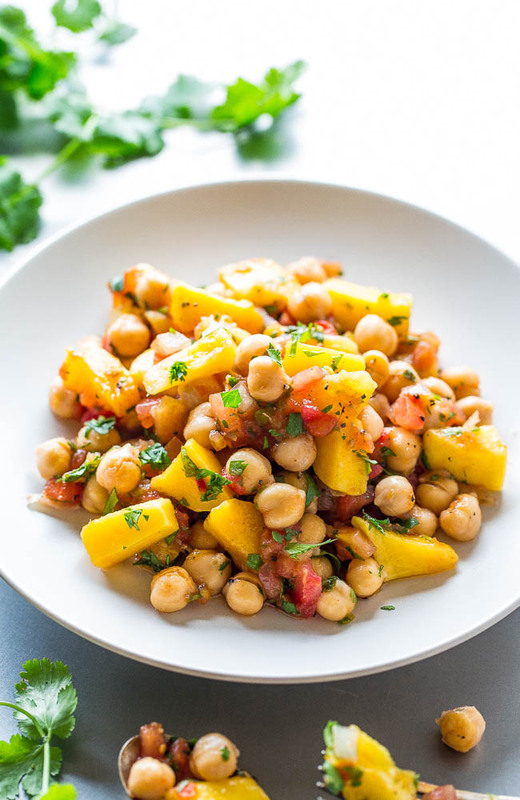 If you have extra veggies you want to incorporate such as cauliflower, bell peppers, tomatoes, or edamame, add them when you add the chickpeas and coconut milk to really make this a veggie-centric dish. It should go without saying, but if you’re making this as a vegan/vegetarian recipe use vegetable broth or water, and use soy rather than fish sauce. To a large skillet, add the oil, onion, and sauté over medium-high heat until the onion begins to soften, about 5 to 7 minutes; stir intermittently. Add the sweet potato and stir to combine with the onions. Add the curry paste, broth or water, salt, pepper, and stir to combine. 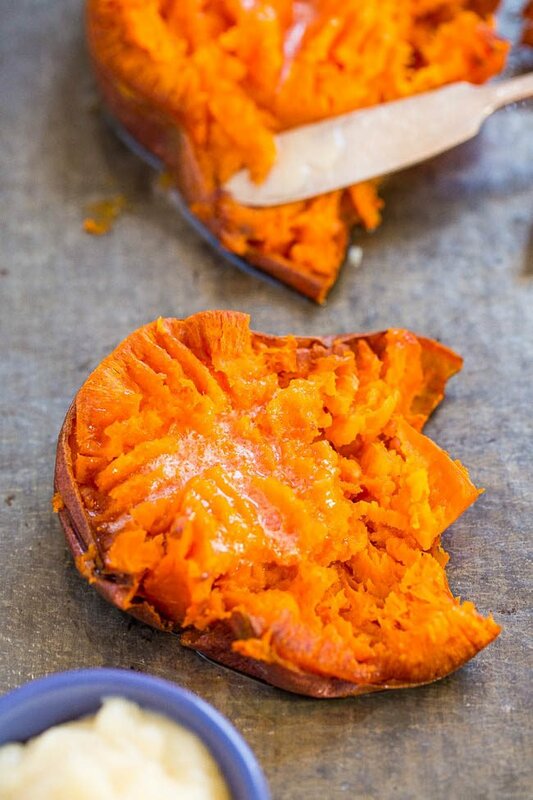 Cover, reduce the heat to medium-low, and allow mixture to gently boil for about 10 minutes, or until sweet potatoes are mostly tender; they don’t have to be completely cooked through yet. 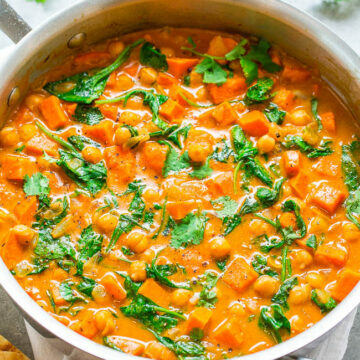 Add the chickpeas, coconut milk, turn the heat to medium-high, and cook uncovered for about 7 to 10 minutes, or until liquid volume has reduced as much as desired and thickens slightly. Add the spinach, optional lime juice, optional soy or fish sauce, and stir to combine. Cook until spinach has wilted and is tender, about 1 to 2 minutes. Taste and optionally add brown sugar, additional curry paste, salt, pepper, etc. to taste. Evenly sprinkle with the cilantro and serve immediately. Curry is best warm and fresh but will keep airtight in the fridge for up to 1 week. 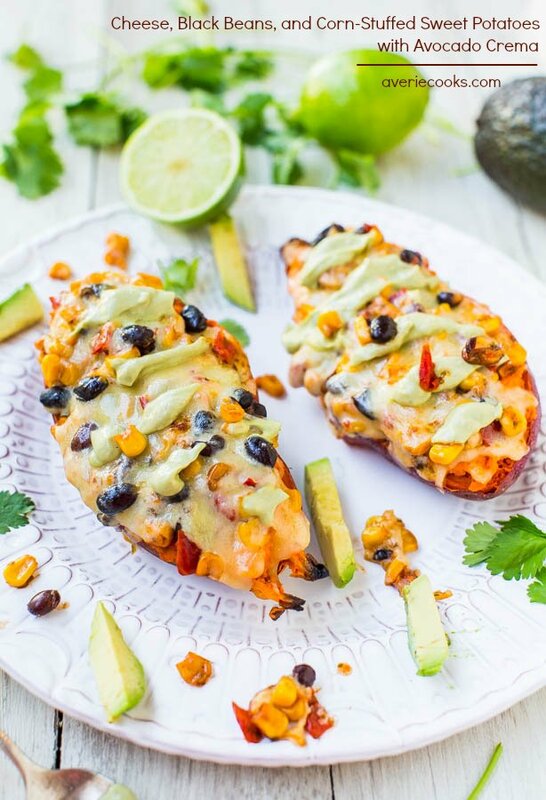 Cheese, Black Beans, and Corn-Stuffed Sweet Potatoes with Avocado Crema – A healthy meal that’s easy, ready in 15 minutes, satisfying, and doesn’t taste like health food! 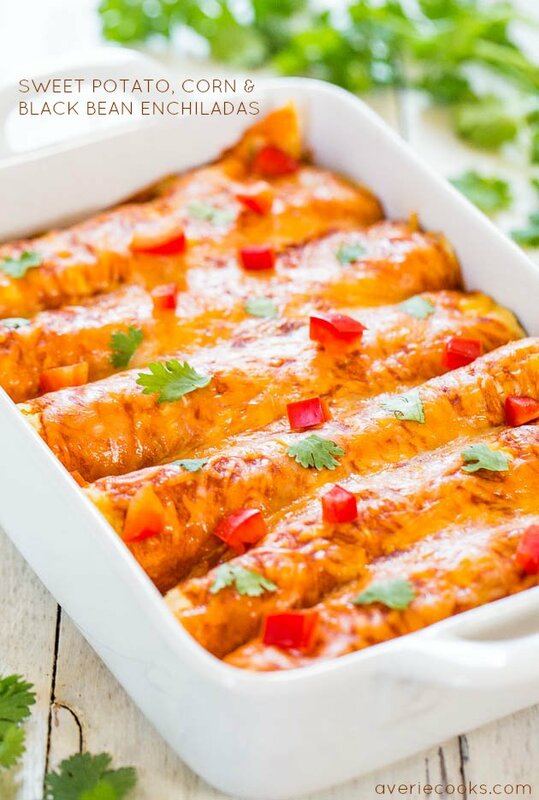 Sweet Potato, Corn, and Black Bean Enchiladas – (vegetarian) – Healthier comfort food that everyone will love! Fast, easy, and tastes amazing! 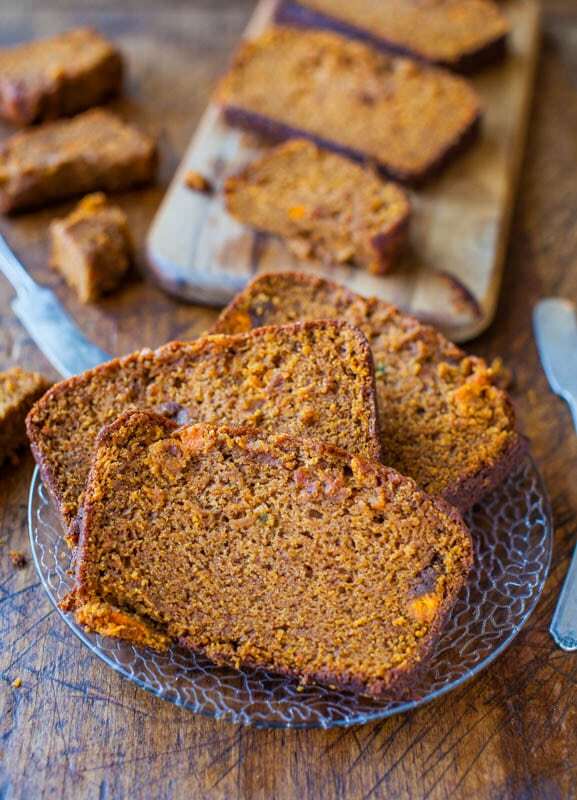 Cinnamon and Spice Sweet Potato Bread – Tender, moist, soft bread that’s full of rich sweet potato flavor! 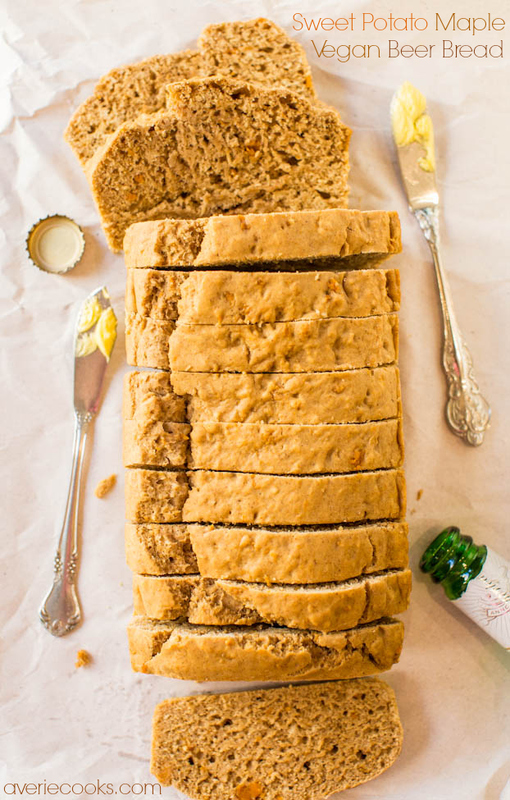 Sweet Potato Maple Vegan Beer Bread – No sugar, no eggs, no butter and no kneading in this soft, fluffy, super moist and flavorful bread! Easiest bread recipe ever! 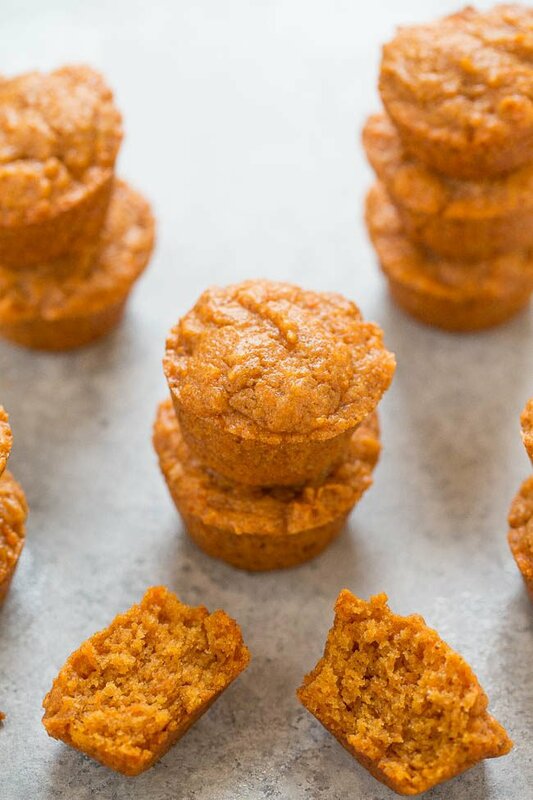 Skinny Mini Sweet Potato Muffins – Only 64 calories each! Soft, super moist, easy, and picky-eater approved! Accidentally vegan but you’d never know it because they taste amazing! I have used curry powder but not Thai curry paste so I am glad you gave an indication as to how spicy it is. I always thought the paste would be too much for me but now I want to try it! I’m sure the coconut milk tempers it some and I can always start off a little conservatively and ramp it up. For my personal taste preferences, I love the Thai curry paste more than traditional curry powder. The flavor profile just speaks to me so much! I don’t really think it’s ‘that’ spicy. There are salsas that are way spicier! Don’t be scared of the heat; at least the Thai Kitchen brand I used isn’t all that spicy (even though they label it as ‘spicy’) but it’s really not when you’re mixing it with the potatoes and the coconut milk. I hope you try this and LMK how it goes! I picked up the Thai kitchen red curry paste and tried this for lunch. I started off with 1 TBS but then added another after the coconut milk went in. I think your assessment is spot on–spicy but no pain or major burn. I am so glad I made this–it tastes awesome and I have a new ingredient to love so thank you for that!! I am so glad you tried this and that you love it as much as I do! Since I’ve made this, I remade it many times, each time throwing in new odds and ends veggies from zucchini to frozen artichoke hearts. Everything has worked great! I even took this basic recipe and then added Double to coconut milk, some water, and turned it into a soup. I think you’re going to love the paste and playing around with it! Glad you thought my assessment was spot on! I’m crazy for curry dishes, just reading the ingredients list is making my mouth water! The cilantro is the perfect topper for this dish! It’s seriously one of my new favorite recipes! I am in love with the Thai red curry paste! 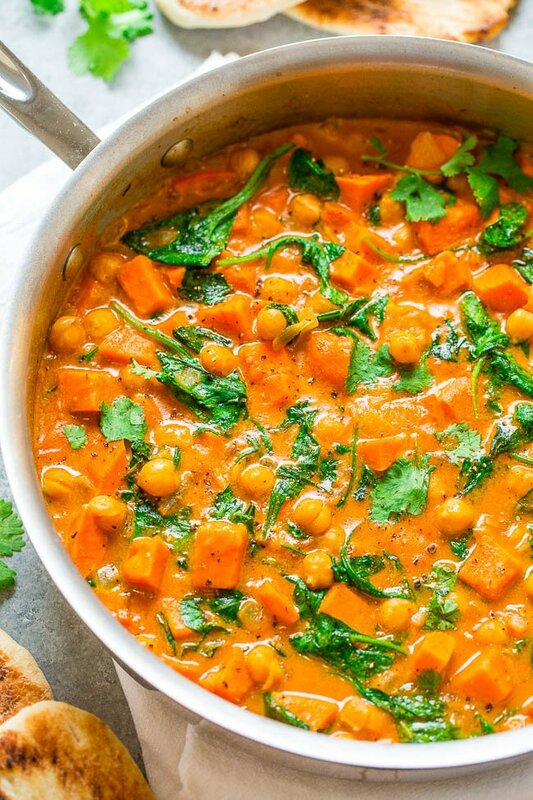 I am loving this fall flavored curry! So pretty and comforting! Made this last night for dinner – so delicious! When my niece came in the door from work she asked “did you order Indian food for dinner?” Thanks for sharing the recipe! Thanks for making it the same day I posted it! And I’m glad it was met with rave reviews! Hi Averie! 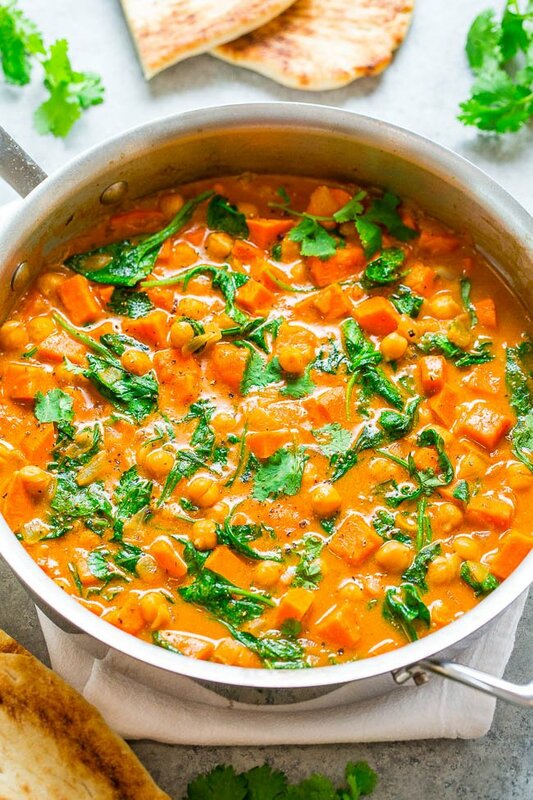 Your Sweet Potato and Chickpea Coconut Curry looks so warm and comforting! Perfect dinner recipe now that the weather is cooling down. :) Pinned! Thanks for trying the recipe and I’m glad it came out great for you! Glad you enjoyed the Thai base rather than an Indian one – I agree, we love it this way! Thanks for trying the recipe and I’m glad it was perfect for you with the 2 tbsp! My daughter just returned from London and was craving Indian food, so I made this last night. We all loved it. She thought it tasted very similar to a favorite meal she there ate many times. Thank you. Thanks for trying the recipe and if it tastes like something she had in London, I’m flattered because they have such amazing curries there! Thanks, yes I saw that recipe too. She’s a vegetarian but I would like to try that one too. We used cauliflower rice with the recipe and it was great. Happy Holidays! Glad the cauliflower rice worked great and I totally understand about the veg needs! Happy Holidays! I love this with the Earth element foods, which are sweet, soft, and nourishing – great for the digestive system. I feel like you crafted this recipe just for me. These are some of my favorite ingredients all in a bowl. I made this tonight using traditional yellow curry powder after I realized that I didn’t have the red paste and just loved, maybe even more than the red because I’ve had that flavor profile a lot. And because I love to put my own twist on recipes and use up left over ingredients I added about a half head of cauliflower, which really rounded out the dish. 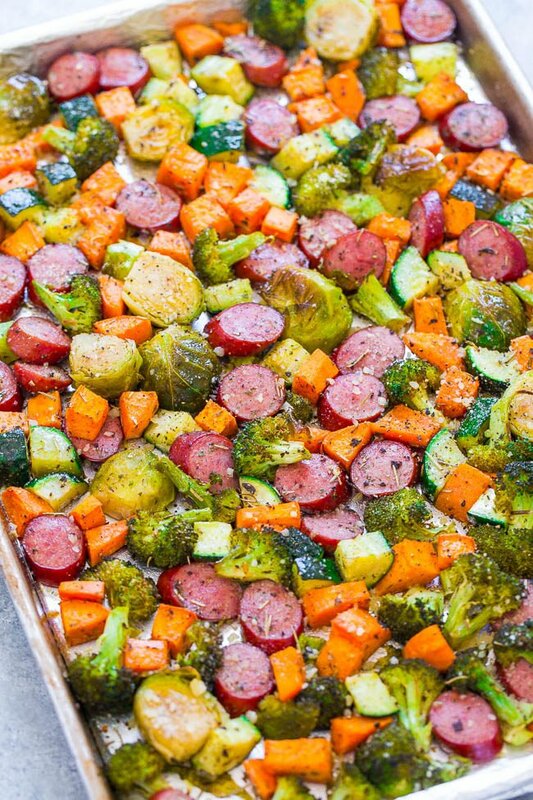 Definitely a wonderful dish to make again and no guilt in eating a big bowl of nutrious veggies. I love Averie Cooks recipes! Thanks for the recommendation. I have it bookmarked. Looks delicious. This is one of the best things I have ever made in my life. Thank you for sharing this. Thanks for the 5 star review and glad it is one of the best things you have ever made! This is a personal favorite of mine as well! I’m on whole 30 and can’t do chickpeas. What’s a good substitute? I’m thinking cauliflower…when in the recipe would i put that in to cook it properly? I have only made it as written so I’m not really sure what to suggest. I do have a chicken version similar to this one. https://www.averiecooks.com/thai-chicken-coconut-curry/ and that one does not have chickpeas in it. If you were to add cauliflower I would edit about 10 minutes from the end, whatever that means. Otherwise it would get mushy and I fear and I don’t like mushy vegetables but do as you think is best. I made it tonight for my mom and myself. I used hot Jamaican curry, since that’s what I had, and didn’t need the optional lime juice, sugar, or fish sauce. It was DELICIOUS! Thanks for the five star review and I’m glad that the Jamaican curry that you had worked great and that this was delicious! Sooo yummy! Made with regular curry powder, cuz that’s all I had, and didn’t add any of the optional things. Delicious! I’ll try again with the Thai red curry…. so happy i stumbled across this recipe! Thanks! Thanks for the five star review and I’m glad this turned out great with just regular curry! Thanks! 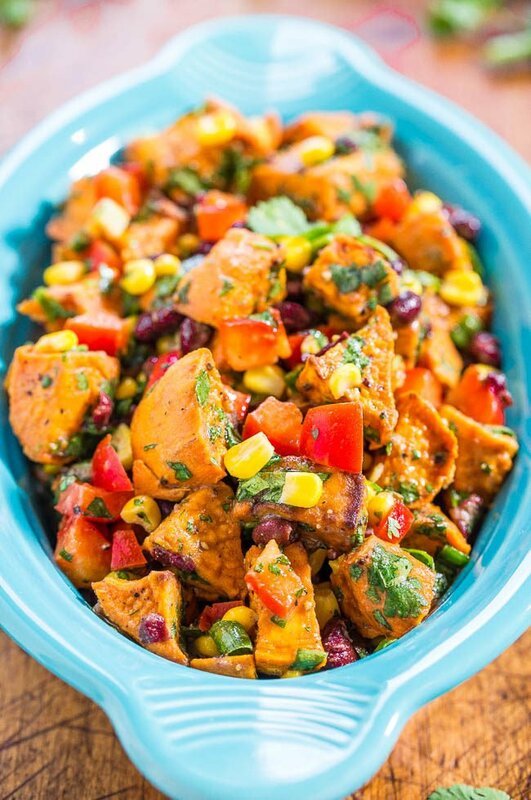 We were making chicken tikka and happened to have a leftover sweet potato sitting around so we looked up sweet potato with chickpea recipes and decided we wanted the coconut curry version. YUM! We did not have any spinach but it still worked. We make a lot of Thai food as well so kept it with the Indian curry – and also a touch of Ras el Hanout (bought in Fex, Morocco) to bring out additional complex flavors.This was great and really complimented the chicken tikka masala. Thanks for the five star review and I’m glad this was a great addition to your chicken tikka masala! This was absolutely AMAZING!!! Even my 13 year olds liked it. I didn’t add the fish sauce or brown sugar, still found it perfectly delicious and sweet. Planning to try many more of your recipes – beautiful photos and nice instructions. Thanks! Thanks for the five star review and I’m glad it was a hit with your kids as well and that you’re going to try other recipes of mine! Thanks for the 5 star review and I’m glad it’s on your regular meal plan!